Chief Minister Lal Thanhawla proceeds to lay flowers on the coffins of the slain policemen. 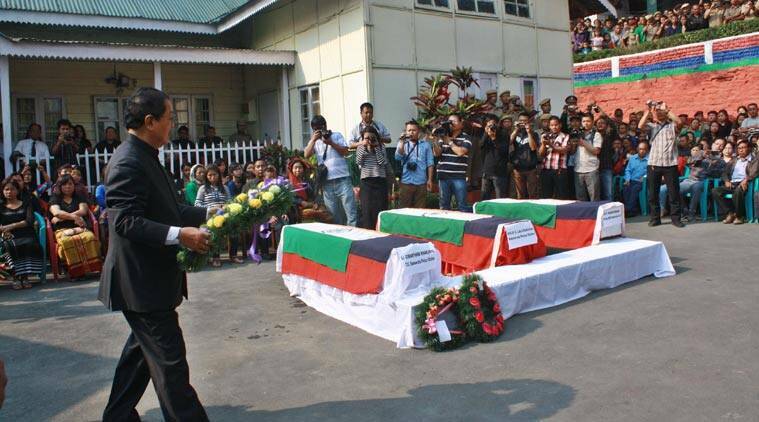 Aizawl, Mar 30 : The Mizoram government on Sunday vowed to retaliate against Saturday’s militant ambush on an MLAs’ convoy that left three policemen dead and six others, including two civilians, injured. “It was an act of grave offense, and [the militants] have challenged the state government. 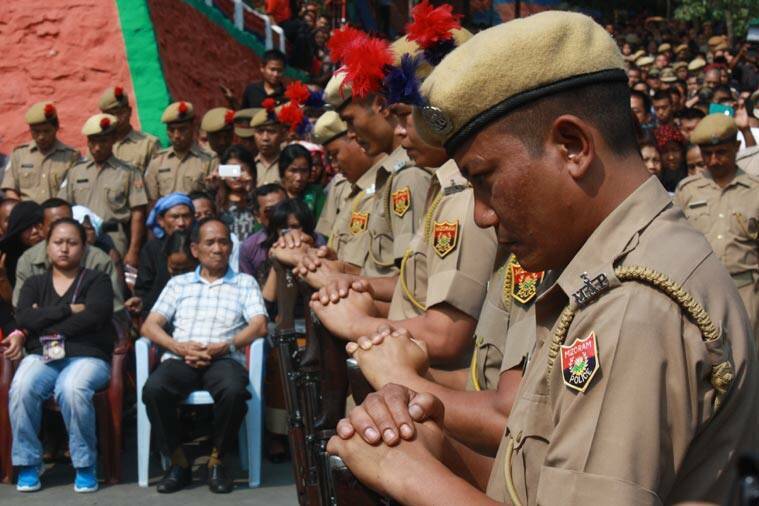 We accept that challenge,” Chief Minister Lal Thanhawla said at a funeral held for the three slain policemen held at the Mizoram Armed Police First Battalion headquarters in Aizawl at 8 am. He announced an ex-gratia of Rs 7 lakhs for the families of the deceased, and promised one relative or family member each of the deceased men would be absorbed into the police force. Mourners pray for the slain policemen during the ceremony of mourning organised by the YMA, a community-based organisation, soon after the convoy’s arrival before dawn on Sunday. The government has blamed the Hmar People’s Convention Democrats (HPCD) for the ambush. The group broke away from the militant-force-turned-political party Hmar People’s Convention and demands an autonomous tribal district for the Hmar tribe of northern Mizoram. Police say their main bases are in southern Manipur. The bodies of the slain policemen, accompanied by colleagues and the MLAs’ convoy that included three legislators and several officials, reached state capital Aizawl shortly after 2 am on Sunday morning. 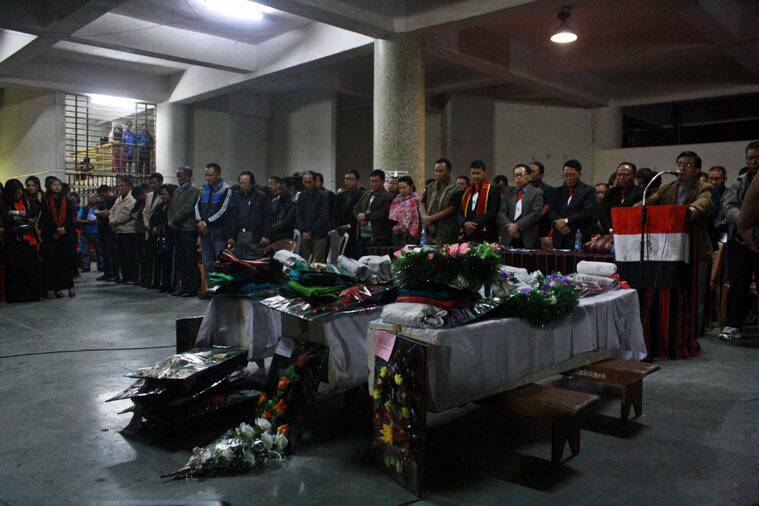 Thousands of men and women waited through the night for their arrival at the Aizawl Municial Council’s office premises at Thuampui as the Young Mizo Association, Mizoram’s largest community-based organisation with members in virtually every household, held a ceremony of mourning for the deceased. YMA leaders called upon those in the crowd to remember that “there should be no ethnic or communal tension or attacks but rather to maintain the unity of ethnic Zos” while passing a resolution demanding the government bring those responsible for the ambush be brought to justice. The convoy transporting the bodies from Sakawrdai, the biggest urban centre near where the ambush took place, was greeted by villagers draped in traditional mourning shawls in at least a dozen hamlets, villages and small towns along the way.